For more information about the project, we invite you to watch the videos, by clicking on the image or through the link below it. Call: 7th Framework Programme for Research, technological Development and Demonstration. Project abstract: Long-term side-effects of radiotherapy impact on the quality-of-life (QoL) of cancer survivors. These side-effects could be reduced if predicted in advance. Previous work identified clinical and biological predictors but a major, coordinated approach is needed to validate them so they can be used clinically. The EU has ~17.8 million people living with a prior diagnosis of cancer of whom ~7 million received radiotherapy. In the long-term, potentially 20% of those suffering with mild to severe side-effects (~1.4 million) might benefit from alleviation of symptoms, with resulting reductions in the cost of care in the EU. REQUITE aims to develop validated clinical models and incorporate biomarkers to identify before treatment cancer patients at risk of side-effects and use the models to design interventional trials aimed at reducing side-effects and improving QoL in cancer survivors who underwent radiotherapy. 4. use the prospectively validated models and biomarkers to design interventional trial protocols aiming to reduce sideeffects and improve QoL in high-risk patients. REQUITE builds on collaborations with a proven history of data sharing, enlarged to a consortium with expertise in patient recruitment, knowledge management, biomarker testing and predictive model development. SME involvement for biomarker assays will facilitate future clinical implementation and commercial exploitation. The outcome of this project will be validated predictive models for three common cancers and trial protocols using the models to investigate interventions aimed at reducing long-term side-effects and improving the QoL of cancer survivors. There were an estimated 3,566 people per 100,000 with a past diagnosis of any type of cancer in the European Union in 2003, equivalent to a prevalence of ~17.8 million . With increasing life expectancies and improvements in diagnosis and treatment, the number of cancer patients and survivors is expected to continue to rise. For example, the estimated number of cancer survivors in the United States increased from 9.8 million in 2001 to 11.7 million in 2007 with 22% accounted for by breast and 19% by prostate cancers . As the illness increasingly becomes a chronic disease, cancer patients’ quality-of-life needs to be addressed in a systematic manner in order to enhance their participation in society, including the workplace. Being Radiotherapy an important curative treatment for cancer,however, (unavoidable) irradiation of surrounding healthy tissue will cause toxic side effects. This toxicity varies in severity, from minor to severe, nature (psychological or, for example, rectal bleeding in prostate cancer survivors) and in duration, from weeks to a lifetime. These long-term side-effects have been shown to impairQoLof cancer survivors . The field also suffers from a lack of standardization in data collection [6,7] and, at present, it is not yet possible to predict who will develop long-term side-effects. 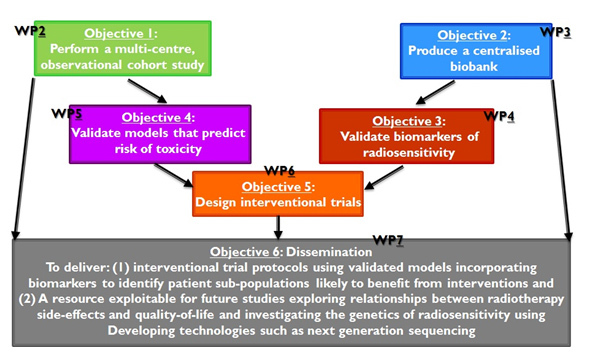 Therefore a prospective multi-centre observational study is/ will be the best way of developing and validating both clinical models and biomarkers that predict for risk of long-term side-effects following radiotherapy.This requires systematic reviews to identify approaches for ameliorating those and the design of interventional clinical trials to reduce them. Finally, although a number of approaches have been explored, no biomarker has been validated for clinical use. Involvement of SMEs is important in this context to bring in technical expertise in assay validation and in development of marketable clinical tests. 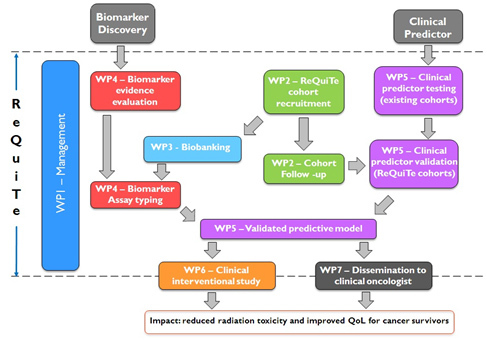 The main goal, and central concept of REQUITE, is to develop validated clinical models incorporating biomarker data to identify before treatment those cancer patients who are at risk of developing long-term side-effects from radiotherapy, to identify the best interventions for reducing the side-effects and to design interventional trials aimed at improving the quality-of-life of cancer survivors who underwent radiotherapy. Perform a multi-centre, longitudinal, observational cohort study collecting: pre-treatment blood samples, epidemiologydata at the start of treatment (e.g. age, weight, height, information on existing health problems such as diabetes,smoking history), treatment data at the end of treatment (radiotherapy dose delivered, fractionation regimen, radiationdoses and volumes to surrounding healthy tissue, additional treatment received), longitudinal side-effect and quality-of-life data (before treatment, end of treatment, year 1, year 2). Produce a centralisedbiobank of DNA from 5,300 patients enrolled in the observational study and a centralised datamanagement system for secure collection, integration, mining, sharing, and archiving of all project data in link-anonymisedform. Validate published biomarkers of individual radiosensitivity. Validate clinical predictors of radiotherapy toxicity in breast, prostate and lung cancer and incorporate biomarker dataif validation is successful. Design interventional trials to reduce long-term side-effects in survivors of breast, prostate and lung cancer by:carrying out systematic reviews to identify the best interventions for the primary endpoints for the three cancers; exploring interventional trial designs; and producing protocols using the validated models and biomarkers. To provide a resource for dissemination and exploitation within the radiotherapy research community. Fragmented databases containing different information Large centralised, easily accessible database withstandardised data collection. Fragmented biobanks using different methodologies Large centralised, easily accessible biobank with samplescollected, processed, stored under SOPs. Biobank linked to a comprehensive clinical database forexploitation in future studies. Knowledge that nr. of factors increase risk of side effects but no validation. Relationships between side-effects not well understood. Limited information on relationship between radiotherapy side-effects and QoL. Known to impact on the health of cancer survivors but the extent of the health burden unknown. Increased understanding of relationships between side-effectendpoints to ID those most informative. Improved understanding of the relationship between sideeffectsand quality-of-life. Detailed information on the extentof the health burden due to radiotherapy side-effects incancer survivors. Increasing nr. of clinical models (risk prediction of long-term side effects) but none validated for its use.The data show their clinical utility (AUC>0.70). Increasing nr. of approaches used inmodel development. Systematic comparison of models for primary endpoints(and secondary endpoints) to identify the best modellingapproach. Validated clinical models ready for clinical implementation. Promising biomarkers but often retrospective studies, no standardisation of assays and differing clinical endpoints used. No biomarker validated for clinical use. First cross- EU standardisation assay formeasuring radiosensitivity. Evidence on whether anapoptosis assay has clinical utility. Validated genetic markersassociated with increased risk of side-effects. Early stage or animal model-based research on interventions to lower radiation toxicity. No pre-treatment targeting toxicity prone patients. Interventional trial protocols aimed at reducing long-termradiotherapy side-effects targeted to those with high risk oftoxicity. The work-packages of the ReQuiTe form part of a tightly integrated project with a clear long-term focus on improving quality-of-lifeof cancer survivors. The project builds on existing evidence of clinical factors and biomarkers that may affect risk for long-termside-effects following radiotherapy, validating them in the new cohorts to create statistical models which can be applied inclinical practice for patient benefit. The leads of each WP have an existing track record of working together through theRadiogenomics Consortium, so are ideally placed to co-ordinate the different strands into an effective whole leading to asuccessful outcome. 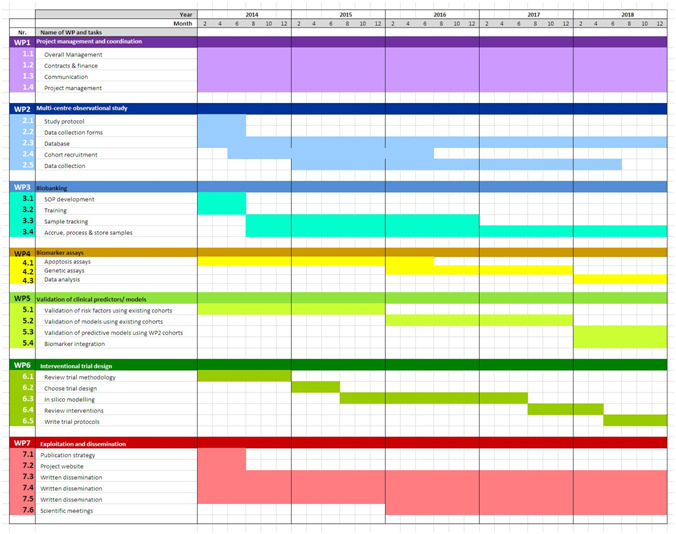 Partner 1 is responsible for overall management and scientific oversight of the project; co-ordination with patient advocates, theethics group, the steering committee and the external advisory group; budgetary control and monitoring of project progressand milestones; co-ordination between work-packages and organisation of annual meetings. Management will be based atUNIMAN. Ethical aspects are important for the multi-centre observational study, biobanking, biological assays and the design of interventional studies aimed at improving the quality-of-life of cancer survivors. Local ethics committees for each partner organisation must approve the project. An Ethical Review Group, formed within the consortium, will review and provide advice on ethical aspects of the project in liaison with a Patient Advisory Group. The project’s Steering Committee ensures partners adhere to ethical rules, as described in the Consortium Agreement. Copies of ethical permission have been requested in anticipation and filed in the Management Office. Advise on dissemination and implementation of a trial design to improve quality-of-life in radiotherapy survivors. Literature (state of the art prior to project’s start and progress beyond). The literature search and revision done for the occasion indicates that, although currently unclear as to what interventions are appropriate, there is a recognized need to developapproaches for identifying patient sub-populations most likely to benefit. Systematic reviews will help identify the most appropriate interventions as will additional evidence that emerges in the next 4-5 years, which can be taken into account in the interventional trials that will be designed in REQUITE. Jeremić B, Miličić B, Milisavljević S. Radiotherapy Alone vs. Radiochemotherapy in Patients With Favorable Prognosis of Clinical Stage IIIA Non-Small-Cell Lung Cancer. Clin Lung Cancer 2013 epub Jan 4. Baili P, Hoekstra-Weebers J, Van Hoof E, et al.Cancer rehabilitation indicators for Europe. Eur J Cancer 2012 epub Dec 10. Centers for Disease Control and Prevention (CDC). Cancer survivors–United States, 2007. Morb Mortal Wkly Rep 2011;60:269-72. Trotti A, Bentzen SM. Need for adverse effects reporting standards in oncology clinical trials. J Clin Oncol 2004;22:19-22. Bentzen SM, Trotti A. Evaluation of early and late toxicities in chemoradiation trials. J Clin Oncol 2007; 25:4096-103. Al-Ghazal SK, Fallowfield L, Blamey RW. Does cosmetic outcome from treatment of primary breast cancer influence psychosocialmorbidity? Eur J Surg Oncol 1999;25:571-3. Barker CL, Routledge JA, Farnell DJ, Swindell R, Davidson SE. The impact of radiotherapy late effects on quality of life ingynaecological cancer patients.Br J Cancer 2009;100:1558-65. De Ruysscher D, Severin D, Barnes E, et al First report on the patient database for the identification of the genetic pathways involved inpatients over-reacting to radiotherapy: GENEPI-II. Radiother Oncol 2010; 97:36-9. West C, Rosenstein BS.Establishment of a radiogenomics consortium. Radiother Oncol 2010;94:117-8. De Souza YG, Greenspan JS. Biobanking past, present and future: responsibilities and benefits. AIDS 2013;27:303-12. Yuille M, Dixon K, Platt A, et al. The UK DNA banking network: a «fair access» biobank. Cell Tissue Bank 2010;11:241-51. Brown J, et al, Ollier WE, Yuille MA. Observational study on variability between biobanks in the estimation of DNA concentration.BMC Res Notes 2009;2:208. Talbot CJ, Tanteles GA, Barnett GC, Burnet NG, Chang-Claude J, Coles CE, Davidson S, Dunning AM, Mills J, Murray RJ, Popanda O,Seibold P, West CM, Yarnold JR, Symonds RP. A replicated association between polymorphisms near TNFα and risk for adverse reactionsto radiotherapy. Br J Cancer 2012;107:748-53. Bentzen SM. Preventing or reducing late side-effects of radiation therapy: radiobiology meets molecular pathology. Nat Rev Cancer2006;6:702-13. Sasse AD, Clark LG, Sasse EC, Clark OA.Amifostine reduces side effects and improves complete response rate during radiotherapy:results of a meta-analysis. Int J Radiat Oncol Biol Phys 2006;64:784-91. West CM, Barnett GC. Genetics and genomics of radiotherapy toxicity: towards prediction. 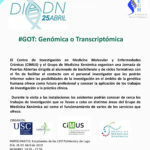 Genome Med 2011; 3:52-62. Hopwood P, Haviland JS, et al, Yarnold JR; START Trial Management Group. Comparison of patient-reported breast, arm, and shouldersymptoms and body image after radiotherapy for early breast cancer: 5-year follow-up in the randomised Standardisation of BreastRadiotherapy (START) trials. Lancet Oncol 2010;11:231-40. Bentzen SM, Agrawal RK, et al, Yarnold JR. The UK Standardisation of Breast Radiotherapy (START) Trial A of radiotherapyhypofractionation for treatment of early breast cancer: a randomised trial. Lancet Oncol 2008;9:331-41. Syndikus I, Morgan RC, Sydes MR, Graham JD, Dearnaley DP. Late gastrointestinal toxicity after dose-escalated conformal radiotherapyfor early prostate cancer. Int J Radiat Oncol Biol Phys 2010; 77:773–783. Kocak Z, Evans ES, Zhou SM, et al. Challenges in defining radiation pneumonitis in patients with lung cancer. Int J Radiat Oncol BiolPhys 2005;62:635-8. Trotti A, Bentzen SM. The need for adverse effects reporting standards in oncology clinical trials. J Clin Oncol 2004;22:19-22. Barnett G, West C, Coles C et al. Standardized Total Average Toxicity score: a scale- and grade-independent measure of late radiotherapytoxicity to facilitate pooling of data from different studies. Int J Radiat Oncol Biol Phys 2012;82:1065-74. Bentzen SM, Trotti A. Evaluation of early and late toxicities in chemoradiation trials. J Clin Oncol 2007;25:4096-103. Farnell DJ, et al, West CM, Davidson SE. Development of a patient-reported questionnaire for collecting toxicity data following prostatebrachytherapy. Radiother Oncol 2010;97:136-42. Farnell DJ, et al, Swindell R, Davidson SE. Efficacy of data capture for patient-reported toxicity following radiotherapy for prostate orcervical cancer. Eur J Cancer. 2010;46:534-40. Yarnold J, Ashton A, Bliss J, et al. Fractionation sensitivity and dose response of late adverse effects in the breast after radiotherapy forearly breast cancer: long-term results of a randomised trial. Radiother Oncol 2005;75:9-17. Fellin G, Fiorino C, et al, Valdagni R. Clinical and dosimetric predictors of late rectal toxicity after conformal radiation for localizedprostate cancer: results of a large multicenter observational study. Radiother Oncol 2009;93:197-202. Marks LB, Bentzen SM, Deasy JO, et al. Radiation dose-volume effects in the lung. Int J Radiat Oncol Biol Phys 2010;76:S70-6. Graham MV, Purdy JA, Emami B, et al. Clinical dose-volume histogram analysis for pneumonitis after 3D treatment for non-small celllung cancer (NSCLC). Int J Radiat Oncol Biol Phys 1999;45:323-9. Barker CL, Routledge JA, Farnell DJ, Swindell R, Davidson SE. The impact of radiotherapy late effects on quality of life ingynaecological cancer patients. Br J Cancer 2009;100:1558-65. Al-Ghazal SK, Blamey RW. Cosmetic assessment of breast-conserving surgery for primary breast cancer. Breast 1999;8:162-8. Vordermark D, Schwab M, Flentje M, Sailer M, Kölbl O. Chronic fatigue after radiotherapy for carcinoma of the prostate: correlationwith anorectal and genitourinary function. Radiother Oncol 2002;62:293-7. Huschka MM, Mandrekar SJ, Schaefer PL, Jett JR, Sloan JA. A pooled analysis of quality of life measures and adverse events data innorth central cancer treatment group lung cancer clinical trials. Cancer 2007;109:787-95. Dehing-Oberije C, De Ruysscher D, et al, Lambin P. Development, external validation and clinical usefulness of a practical predictionmodel for radiation-induced dysphagia in lung cancer patients. Radiother Oncol 2010;97:455-61. Roeder F, Friedrich J, Timke C, et al. Correlation of patient-related factors and dose-volume histogram parameters with the onset ofradiation pneumonitis in patients with small cell lung cancer. Strahlenther Onkol 2010;186:149-56. Bentzen SM. Preventing or reducing late side-effects of radiation therapy. Nat Rev Cancer 2006; 6:702-13. Eifel PJ, Jhingran A, Bodurka DC, Levenback C, Thames H. Correlation of smoking history and other patient characteristics with majorcomplications of pelvic radiation therapy for cervical cancer. J Clin Oncol 2002;20:3651-7. Marks LB, Yorke ED, Jackson A, et al. Use of normal tissue complication probability models in the clinic. Int J Radiat Oncol Biol Phys2010;76(3 Suppl):S10-9. Bentzen SM, Constine LS, Deasy JO, et al. Quantitative Analyses of Normal Tissue Effects in the Clinic (QUANTEC): an introduction tothe scientific issues. Int J Radiat Oncol Biol Phys 2010;76(3 Suppl):S3-9. Marks LB, Yorke ED, Jackson A, Ten Haken RK, Constine LS, Eisbruch A, Bentzen SM, Nam J, Deasy JO. Use of normal tissuecomplication probability models in the clinic. Int J Radiat Oncol Biol Phys 2010;76(3 Suppl):S10-9. Graham MV, Purdy JA, Emami B, Harms W, Bosch W, Lockett MA, Perez CA. Clinical dose-volume histogram analysis for pneumonitisafter 3D treatment for non-small cell lung cancer (NSCLC). Int J Radiat Oncol Biol Phys 1999;45:323-9. Fiorino C, Fellin G, et al, Valdagni R. Clinical and dosimetric predictors of late rectal syndrome after 3D-CRT for localized prostatecancer: preliminary results of a multicenter prospective study. Int J Radiat Oncol Biol Phys 2008;70:1130-7. El Naqa I, Bradley JD, Lindsay PE, Hope AJ, Deasy JO. Predicting radiotherapy outcomes using statistical learning techniques. PhysMed Biol 2009;54:S9-S30. Gulliford SL, Webb S, Rowbottom CG, et al. Use of artificial neural networks to predict biological outcomes for patients receivingradical radiotherapy of the prostate. Radiother Oncol 2004;71:3-12.Tomatis S, Rancati T, et al, Valdagni R. Late rectal bleeding after 3D-CRT for prostate cancer: development of a neural-network-based predictive model. Phys Med Biol 2012;57:1399-412. Chen S, Zhou S, Yin FF, Marks LB, Das SK. Investigation of the support vector machine algorithm to predict lung radiation-inducedpneumonitis. Med Phys 2007;34:3808-14. Defraene G, Van den Bergh L, Al-Mamgani A, et al. The benefits of including clinical factors in rectal normal tissue complicationprobability modeling after radiotherapy for prostate cancer. Int J Radiat Oncol Biol Phys 2012;82:1233-42.
the first set of nomograms for late rectal syndrome. Int J Radiat Oncol Biol Phys 2012;82:1957-66. Trott KR, Doerr W, Facoetti A, et al. Biological mechanisms of normal tissue damage: importance for the design of NTCP models.Radiother Oncol 2012;105:79-85. Defraene G, Van den Bergh L, Al-Mamgani A, et al.The benefits of including clinical factors in rectal normal tissue complicationprobability modeling after radiotherapy for prostate cancer. Int J Radiat Oncol Biol Phys. 2012 Mar 1;82(3):1233-42. Dehing-Oberije C, De Ruysscher D, et al. Development, external validation and clinical usefulness of a practical prediction model forradiation-induced dysphagia in lung cancer patients. Radiother Oncol. 2010 Dec;97(3):455-61. Barnett GC, et al, Burnet NG, Coles CE. The Cambridge Breast Intensity-modulated Radiotherapy Trial: patient- and treatment-relatedfactors that influence late toxicity. Clin Oncol 2011;23:662-73. Collette S, Collette L, Budiharto T, et al; Predictors of the risk of fibrosis at 10 years after breast conserving therapy for early breastcancer: a study based on the EORTC Trial 22881-10882 ‘boost versus no boost’. Eur J Cancer 2008;44:2587-99. De Langhe S, De Ruyck K, et al, Thierens H. Acute Radiation-Induced Nocturia in Prostate Cancer Patients Is Associated WithPretreatment Symptoms, Radical Prostatectomy, and Genetic Markers in the TGFβ1 Gene. Int J Radiat Oncol Biol Phys 2013;85:393-9. Tucker SL, Li M, Xu T, et al. Incorporating Single-nucleotide Polymorphisms Into the Lyman Model to Improve Prediction of RadiationPneumonitis. Int J Radiat Oncol Biol Phys 2013;85:251-7. Palma DA, Senan S, Tsujino K, et al. Predicting Radiation Pneumonitis After Chemoradiation Therapy for Lung Cancer: An InternationalIndividual Patient Data Meta-analysis. Int J Radiat Oncol Biol Phys 2013;85:444-50. Bradley JD, Hope A, El Naqa I, et al A nomogram to predict radiation pneumonitis, derived from a combined analysis of RTOG 9311 andinstitutional data. Int J Radiat Oncol Biol Phys 2007;69:985-92. Hope AJ, Lindsay PE, El Naqa I, Alaly JR, Vicic M, Bradley JD, Deasy JO. Modeling radiation pneumonitis risk with clinical,dosimetric, and spatial parameters. Int J Radiat Oncol Biol Phys 2006;65:112-24. West CM, Davidson SE, Elyan SA, et al. Lymphocyte radiosensitivity is a significant prognostic factor for morbidity in carcinoma of thecervix. Int J Radiat Oncol Biol Phys 2001;51:10-5. Crompton NE, Miralbell R, et al, Ozsahin M. Altered apoptotic profiles in irradiated patients with increased toxicity. Int J Radiat OncolBiol Phys 1999;45:707-14. Barber JB, West CM, Kiltie AE, et al. Detection of individual differences in radiation-induced apoptosis of peripheral blood lymphocytesin normal individuals, ataxia telangiectasia homozygotes and heterozygotes, and breast cancer patients after radiotherapy. Radiat Res2000;153:570-8. Crompton NE, Shi YQ, et al, Ozsahin M. Sources of variation in patient response to radiation treatment. Int J Radiat Oncol Biol Phys2001;49:547-54. Ozsahin M, Crompton NE, et al, Azria D. CD4 and CD8 T-lymphocyte apoptosis can predict radiation-induced late toxicity: aprospective study in 399 patients. Clin Cancer Res 2005;11:7426-33. Schnarr K, Boreham D, Sathya J, Julian J, Dayes IS. Radiation-induced lymphocyte apoptosis to predict radiation therapy late toxicity inprostate cancer patients. Int J Radiat Oncol Biol Phys 2009;74:1424-30. Bordón E, Henríquez-Hernández LA, Lara PC, et al. Role of CD4 and CD8 T-lymphocytes, B-lymphocytes and Natural Killer cells in theprediction of radiation-induced late toxicity in cervical cancer patients. Int J Radiat Biol 2011;87:424-31. Henríquez-Hernández LA, Carmona-Vigo R, Pinar B, et al. Combined low initial DNA damage and high radiation-induced apoptosisconfers clinical resistance to long-term toxicity in breast cancer patients treated with high-dose radiotherapy. Radiat Oncol 2011;6:60. West CM, Barnett GC. Genetics and genomics of radiotherapy toxicity: towards prediction. Genome Med 2011;3:52. Barnett GC, Coles CE, Elliott RM, et al, Bentzen SM, Dearnaley DP, Burnet NG, Pharoah PD, Dunning AM, West CM. Independentvalidation of genes and polymorphisms reported to be associated with radiation toxicity: a prospective analysis study. Lancet Oncol2012;13:65-77. Fachal L, Gómez-Caamaño A, Sánchez-García M, Carballo A, Peleteiro P, Lobato-Busto R, Carracedo A, Vega A. TGFβ1 SNPs and radio-induced toxicity in prostate cancer patients. Radiother Oncol 2012;103:206-9. Barnett GC, Elliott RM, Alsner J, et al. Individual patient data meta-analysis shows no association between the SNP rs1800469 in TGFBand late radiotherapy toxicity. Radiother Oncol 2012;105:289-95. Talbot CJ, Tanteles GA, Barnett GC, et al. A replicated association between polymorphisms near TNFα and risk for adverse reactions toradiotherapy. Br J Cancer 2012;107:748-53. Kerns SL, Ostrer H, et al, Rosenstein BS. Genome-wide association study to identify single nucleotide polymorphisms (SNPs) associatedwith the development of erectile dysfunction in African-American men after radiotherapy for prostate cancer. Int J Radiat Oncol Biol Phys2010;78:1292-300. Kerns SL, et al, Ostrer H, Rosenstein BS. A 2-stage genome-wide association study to identify single nucleotide polymorphismsassociated with development of erectile dysfunction following radiation therapy for prostate cancer. Int J Radiat Oncol Biol Phys2013;85:e21-8. De Ruyck K, Sabbe N, Oberije C, Vandecasteele K, Thas O, De Ruysscher D, Lambin P, Van Meerbeeck J, De Neve W, Thierens H.Development of a multicomponent prediction model for acute esophagitis in lung cancer patients receiving chemoradiotherapy. Int J Radiat Oncol Biol Phys 2011;81:537-44. Prasanna PG, Stone HB, Wong RS, Capala J, Bernhard EJ, Vikram B, Coleman CN. Normal tissue protection for improving radiotherapy:Where are the Gaps? Transl Cancer Res 2012;1:35-48. Bentzen SM. Preventing or reducing late side-effects of radiation therapy: radiobiology meets molecular pathology. Nat Rev Cancer2006; 6:702-13. Mollà M, Gironella M, Salas A, et al. Protective effect of superoxide dismutase in radiation-induced intestinal inflammation. Int J RadiatOncol Biol Phys 2005;61:1159-66. Geiger H, Pawar SA, Kerschen EJ, et al. Pharmacological targeting of the thrombomodulin-activated protein C pathway mitigatesradiation toxicity. Nat Med 2012;18:1123-9. Henson C. Chronic radiation proctitis: issues surrounding delayed bowel dysfunction post-pelvic radiotherapy and an update on medicaltreatment. Therap Adv Gastroenterol 2010;3:359-65. Rosenman J. Can the use of amifostine improve cure rates for patients with advanced non-small cell lung cancer? Semin Oncol 2004;31:52–8. Derived publications and/ or otherproject contributions (by 01/08/2014).